Addis Ababa University and Addis Ababa City Government Plan Commission (AAPCo) signed collaborative agreement on February 8, 2019 at AAU President Office. Prof. Tassew Woldehanna, AAU President during the signing ceremony emphatically noted that AAU and Addis Ababa City Administration have been working many activities together; the signing of today’s agreement would avoid bureaucratic challenges and help us work more efficiently in a better way for the future specifically in the urban planning sector. Prof. Tassew also stated that community service is one of our mandates and the university has been working diligently on various impact research based community services for the country in general and for the city administration in particular. He further expressed his commitment for the practical implementation of the agreement signed between the two parties. 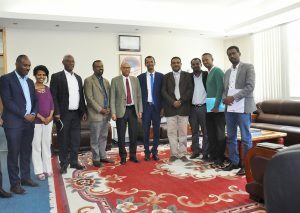 Dereje Fikjadu, Commissioner, Addis Ababa City Plan Commission on his part said that we are very happy to work with this pioneer higher education institution and the owner of various research and knowledge in general. Tomorrow’s urban planners, architects and economists are from universities, said Dereje, hence today’s agreement is of significant importance for tomorrow’s city administration betterment. • To accept urban planning and related field of study internship students of the University.